Citibank Japan Ltd.’s net income of 1.34 billion yen ($12.9 million) in the year ended March compared with CEO Michael Corbat’s total 2013 compensation of $14.5 million. The U.S. bank has begun approaching Japanese companies including the three biggest lenders, trust banks and regional lenders, a person familiar with the matter said this week. Unprecedented monetary stimulus has cut the spread between lending rates and deposit rates at Mitsubishi UFJ Financial Group Inc. to a record low in the first quarter. Cash and deposits at the nation’s biggest bank and its two closest rivals piled to 82 trillion yen last quarter. Citigroup is considering a retreat from Japan after pulling back from retail banking in markets with low returns, including Spain, Greece and Turkey. 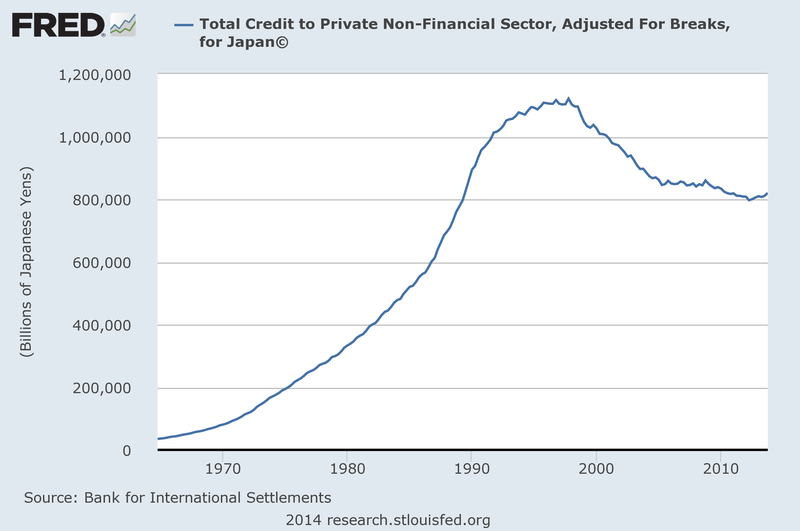 The difficulties to make money probably have something to do with the weak demand for loans in Japan. Obviously, banking is demand-led. You cannot supply borrowers if they don’t demand anything. For the last 20 years, the private sector has been reducing its liabilities. To make up for the shortfall in effective demand, government spent hundreds of billions of yen to keep the economy at somewhere close to full employment. Compared with what Spain and Greece are going through it has been a resounding policy achievement so far. However, government bonds are boring for bankers, especially if the central bank buys them up and clearly fixes the prices (which it does anyway, but it is more obvious now in Japan then ever). There does not seem to be any indication that this will change in the near future, especially not after the unsurprising big dent to GDP growth after the latest tax hike (Reuters). George Soros made almost $1 billion since November from bets that the yen would tumble, according to a person close to the billionaire’s $24 billion family office. The Japanese wager helped the firm return about 10 percent last year and 5 percent so far this year, said the person, who asked not to be named because the firm is private. The yen has weakened 17 percent versus the dollar since about the start of the fourth quarter, the worst performance over a similar period since 1985. With no further weakening of the yen in sight, bankers and central bankers in Japan might as well enjoy a vacation or two. Probably it would be their first since ‘the crisis’ which started in 1991. They could try to think about a new concept to describe what has happened to Japan and discuss existing economic theories in order to solve the countries economic woes. One hint: another tax hike is not a good idea. Another hint: it is not a problem of social justice or the budget, it is a macroeconomic problem. Which some say started with Wicksell back in 1898. « There is no ‘great bond mispricing’ in the US.